Black and white image of the rear fuselage of an airplane. The upright stabilizer is painted with a cartoon animal wearing an aviator or bomber's hat with goggles and a scarf wrapped around its neck. 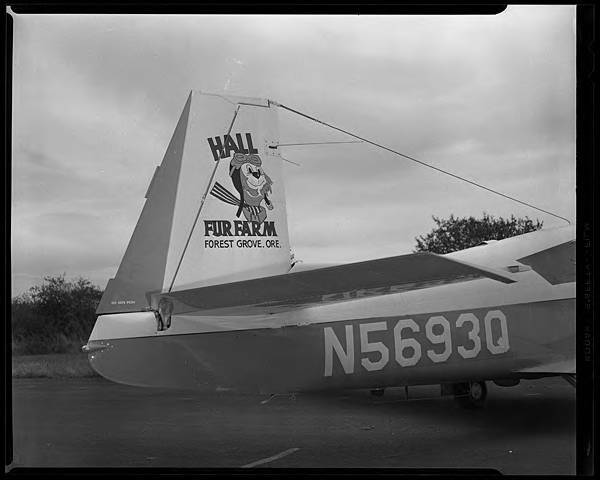 Printed on the tail around the image is 'Hall Fur Farm, Forest Grove, Oregon.' The registration number of the airplane is N5693Q. This image was part of the Herbert McMullen bequest. McMullen was a local photographer who also collected other images of daily life in the area.